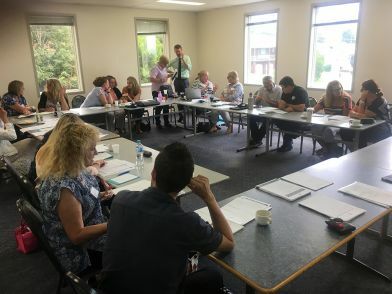 As a part of the Fair Funding Now campaign, Federation has conducted six targeted campaign training days involving Federation Representatives, parents and principals in the key electorates of Banks, Gilmore, Page and Robertson. The campaign training course was developed following extensive examination of qualitative and quantitative research conducted with members following the 2016 phase of the schools funding campaign. A key finding of the research was members’ desire for greater support and training in engaging with the parent community on the matter of schools funding. A prime purpose of the training courses was therefore to equip participants with the knowledge, skills and understanding to assist in detailed, campaign specific, one-on-one conversations aimed at connecting and engaging parents and community members around the issue of schools funding and the threat of the Turnbull Government’s funding plan to local public schools. Members were also provided with detailed analysis of the electoral and demographic landscape of their electorates and school communities, which provided the opportunity to discuss the role this may play in the planning and execution of future campaign activities and community engagement strategies. The full-day training activity further provided a valuable opportunity for schools to work together to discuss the benefits of needs-based funding and share their successes with other participants. Local teachers and principals were able to connect with the parent community and plan campaign actions and activities aimed at promoting their successes and drawing attention to the need for Fair Funding for schools in their communities. Participant feedback has indicated that the overwhelming majority of those that undertook the training left having a clear understanding of the Fair Funding Now campaign as well as feeling better placed to have one-on-one conversations with colleagues and the wider community.